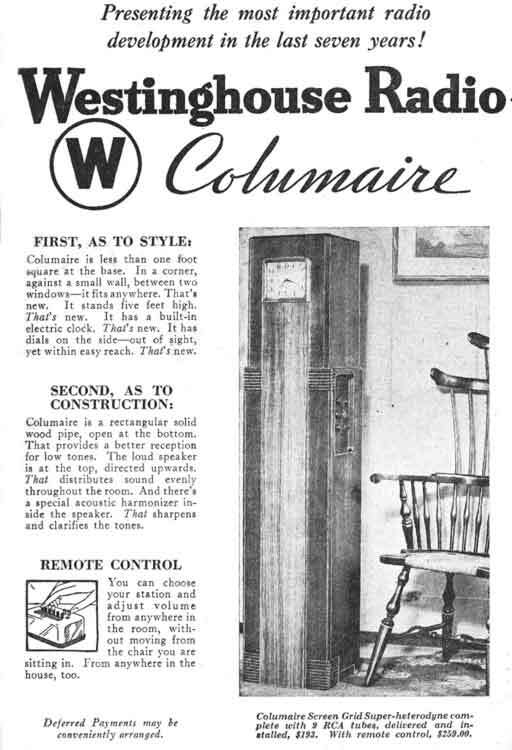 The WR8 "Columaire" cabinet is a magnificent example of Art Deco skyscraper styling designed by Raymond Loewy and was advertised as a versatile piece of furniture that only occupied one square foot of floor space. 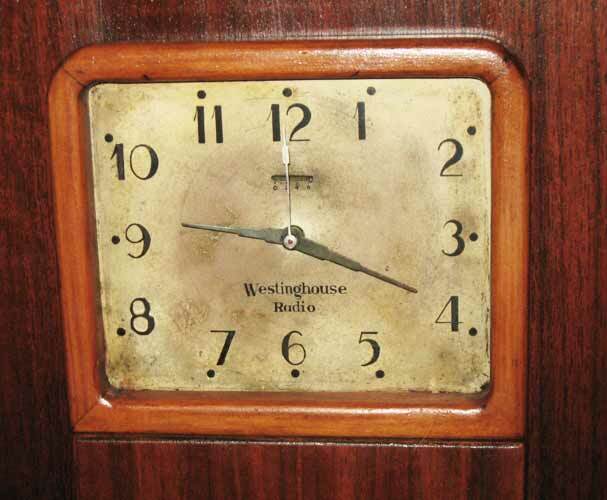 The WR8 has a built-in Westinghouse electric clock with an unique movement. The seconds hand moves like a ticking clock, but is really operated by an AC motor with gearing that abruptly advances once a second. There's an interesting little lever above the clock hands for setting the amount of minutes that the AC power can go out without stopping the clock. For instance, setting the lever to 2 minutes means if the total power outage times are within 2 minutes then the clock will resume operation once power is restored, otherwise the mechanical timer inside the clock counts down and stops the motor from starting up again to alert the user that the clock has to be reset. 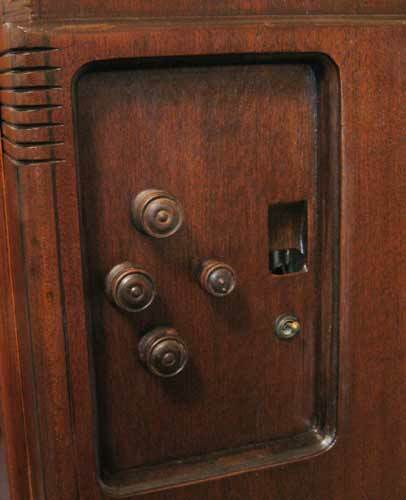 The radio is a RCA Radiola 82 and is a two-piece chassis for the receiver and power supply/amplifier. The chassis were originally designed to be mounted horizontally and Westinghouse mounted them vertically to fit in the cabinet. Filament sag was evidently a concern with the 45 audio output tubes and the 80 rectifier. A socket strip was mounted on the side of the cabinet seen at the bottom right of the rear view image below so these tubes could be inserted vertically. Long wires connect this strip of sockets to the original sockets on the chassis and looks like an amateur solution but is straight from the factory! The WR8 was originally offered for $193 without the remote and $259 with the remote. WR8 radios are not very common and the remote version is even less common. I purchased the radio locally from a lady who held onto it for 34 years before posting it on Craigslist in Austin, Texas. 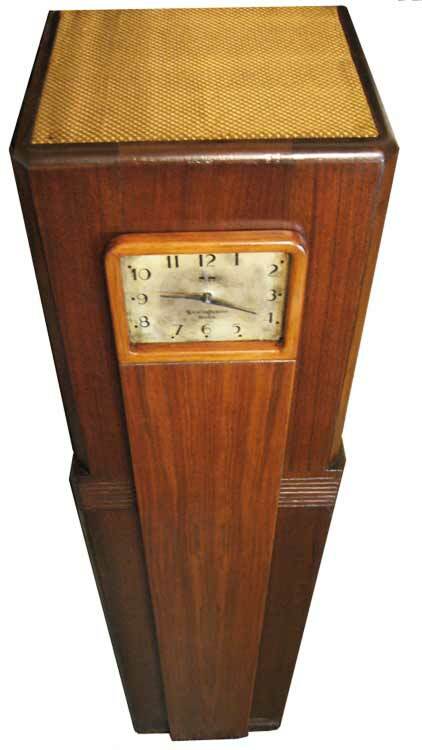 My example had been refinished in all mahogany and was not the correct original finish. The original finish was two-tone with dark walnut on the sides and the center strip was a light maple color. I stripped and refinished the cabinet with special walnut on the sides and plain urethane with no stain for the center piece. The two-tone contrast is more subtle on mine than other original examples but I like how it came out. The radio had signs of repairs done in the past and unfortunately had bad interstage and audio output transformers. The Hammond 124A (10K primary and 90K secondary impedance) and 125E universal tube output transformer worked well for replacing the interstage and audio output transformers respectively.